When last I left Felix and Gabriek in Soon, Book 5 of the Felix and Zelda family of books, I wrote that I hadn’t really gotten a sense of closure when I finished reading but perhaps that is as it should be. WWII was over and I was pretty sure it was the last in the Felix and Zelda series. Well, as you can see, I was wrong. Maybe is the 6th and next to the last book in the series (how do I know there’s going to be a 7th? Because I read that all-important Dear Reader from Morris Gleitzman at the end of the book). It’s 1946, and Felix is 14 years old. He and Gabriek are traveling back to Gabriek’s farm with a very pregnant Anya. What a surprise when they arrive and discover a group of men rebuilding the farmhouse the Nazis had burned it down in After (Book 4). A neighbor has claimed the land as his own, and soon Felix, Gabriek, and Anya are on the run again. Anti-Jewish hate is still strong, and Gabriek is considered a traitor for having hidden Felix during the war. In an attempt to straighten things out, Felix, Gabriek, and Anya go to town, where they are soon surrounded by a large, angry mob, including Felix’s old enemy, the sadistic Cyryl (Then, Book 2). A fight breaks out and both Felix and Gabriek are seriously injured before it is broken up by an Australian air man and his female driver, a woman named Celeste. Unfortunately, the Australian is seriously shot, but with his partisan training as Dr. Zajek’s medical assistant (After, Book 4), Felix is able to save him before being knocked unconscious himself. When he wakes up, Felix finds he is at an air base set up by the Australian Air Force along with Anya and a still unconscious and seriously injured Gabriek. Eventually, the three are able to leave hospital and stay with Celeste, who has her own war horror story. Felix is introduced to a man named Ken who wants to take him back to Australia as a war survivor to show Australians what they were fighting and dying for, and to help repopulate the country after suffering so much loss of life in the war. Felix isn’t too keen on the plan because he would have to leave Gabriek and Anya behind until he completely healed and she has her baby. Nevertheless, Felix reluctantly agrees to fly to Australia on condition that Gabriek, Celeste, Anya and the baby will follow by ship as soon as possible. The plane is a Lancaster, a heavy British bomber, and it doesn’t take long to discover that there is a stowaway on board. And while Felix and Anya finally think they are on their way to a safe place, their story is far from over. And once again, Felix is faced with a life and death decision similar to the one he made in Once, Book1, when he and 6 year old Zelda jumped from the train that was taking them to a concentration camp and certain death. Will Felix and Anya survive their jump? Maybe can be read as a stand alone novel or in the sequence in which it was written. Gleitzman includes enough background information for readers new to the series to know what they need to know about Felix, Gabriek, and Anya’s past. And he continues exploring themes of family, friendship, as well as the aftermath of war (including kindness, hate, help, loss, and revenge), and now, emigrating to a new country. You would think that by the sixth book about the same character the appeal and quality would have worn thin, if not worn out. Not so with the Felix and Zelda family of books, as Gleitzman calls them. Felix is four years older than when the series began, and yet, he is still the same optimist with an good helping of naivety thrown in despite the fact that his life has been full of false hopes and lots of maybes so far. And I can’t help but wonder why he isn’t angry, bitter, and resentful given what he has gone through and the people he has loved and lost. It is a credit to Gleitzman’s writing that the series is still so vibrant, and even more relevant in today’s world where intolerance of others is on the rise. It has been an interesting journey with Felix and the various people he met along the way. 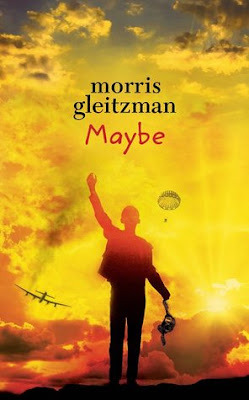 I am looking forward to reading Always, the 7th and final book, in which Gleitzman says he will bring Felix’s story full circle. I can't help but wonder how. Maybe has already been released in Australia and Britain, but not yet in the United States. Once again, I was anxious to read it, and bought a copy from Book Depository (hooray for free delivery worldwide), and couldn't put it down once I started reading. When we think of ships being torpedoed in the Atlantic Ocean during WWII, we generally think of warships being sunk by Nazi submarines, or U-boats. In fact, the first ship sunk after England declared war on Germany on September 3, 1939 was a British passenger ship, the S.S. Athenia, attacked less then 10 hours later. Mullenbach introduces her readers to the events that led to the sinking of the Athenia and the aftermath mainly through the experiences of two teens who were on the ship and survived. Russell Park, 11, lived in Philadelphia but was already an experienced traveler, who loved history and was fascinated by how things worked. Florence Kelly, 14, lived in Cleveland, loved big band music and going to the movies with her best friend on Saturdays. They were “…two ordinary American kids who weren’t thinking about the frightening actions of world leaders…” (pg 8) as they prepared for their European vacations in May 1939. And though their summer vacations were cut short by world events, they had been wonderful. But, when Hitler invaded Poland on September 1,1939, Americans in Europe scrambled to book passage, hoping to return home before war began. 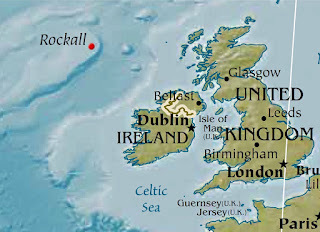 Through a combination of circumstances, Russell, along with his parents, and Florence and her mother ended up on the same ship sailing home. Both Russell and Florence were looking forward to returning home to family, friends, and the new school year. There were 1,102 passengers and 316 crew on board the Athenia when the ship began her journey across the Atlantic Ocean. At the same time, a German U-boat was also in the Atlantic, commanded by Oberleutnant Fritz Julius Lempe, and searching for ships carrying troops and war materials, which is what he supposedly thought the Athenia was doing when he gave the order to torpedo it. Mullenbach covers a lot of ground in Torpedoed! Placing Florence and Russell at the center of events, she manages to fit in a lot of historical information about what was happening in prewar Europe, as well as giving readers an up-close and personal account of the harrowing sinking and rescue of the Athenia’s survivors (128 people did not survive). She even follows up with information about the commander who mistakenly (?) bombed the Athenia. Mullenbach carefully crafts a detailed narrative of this ill-fated journey that is both gripping and so terrifying at times and completely accessible for young readers. And ironically, while their paths crossed several times, Florence and Russell never actually met before, during, or after the Athenia was sunk. Torpedoed! 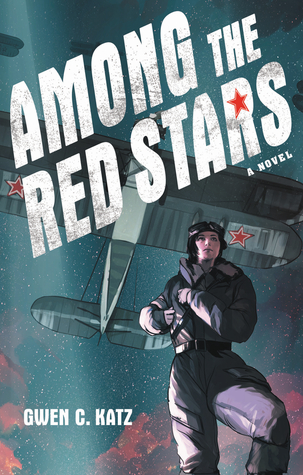 is a story that will certainly appeal to everyone, but especially to young readers interested in history, WWII, and nonfiction survivor accounts. Mullenbach has also included lots of photographs and maps to help orient readers, as well as a Time Line of events, Notes and a Bibliography for those interested in more information. Threads of Blue is the sequel to Beautiful Blue World, a story about children involved in an nameless war between fictional countries, a landscape that bears an uncanny resemblance to Europe. After being tested for their suitably, some children of Sofarende are sent away from their families to a remote area called Faetre as part of an Adolescent Army unit, where they worked on important intelligenc for the war effort. While in Faetre, the children were not allowed any contact with their families. 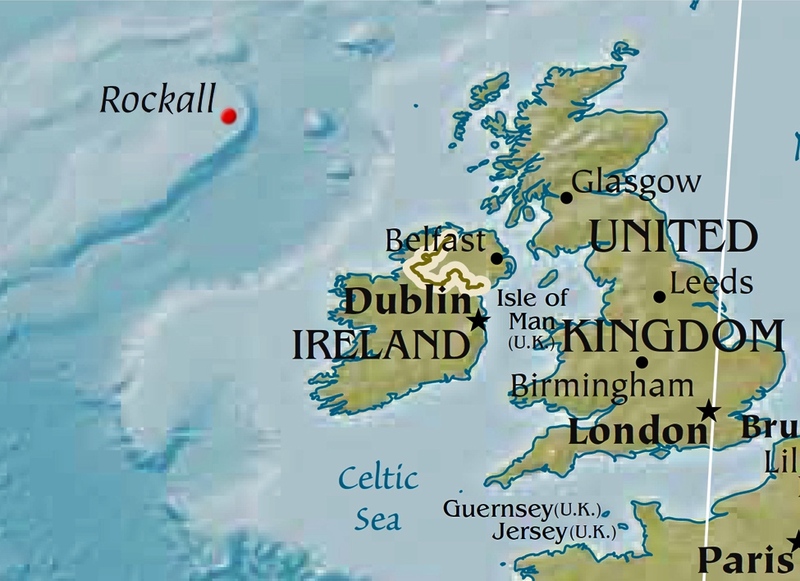 You may recall that at the end of Beautiful Blue World, Mathilde Joss, 12, had committed what might be considered an act of treason that had caused her to become separated from the other members of her Adolescent Army unit as they are being evacuated to the safety of Eilean, an ally of Sofarende. Now, Mathilde must try and find out where the Adolescent Army is on Eilean, after being brought across the sea that separates it from Sofarende. There is danger everywhere, even on Eliean, but Mathilde meets a kind family who takes her to a refugee camp to wait until she is eventually reunited with the other Sofarende kids and adults in her unit. Once reunited with them, Mathilde waits to see if she will be punished for what she did before leaving Sofarende. And, even worse, her best friend Megs refuses to speak to her or even look at her for reasons Matilde can’t figure out, yet everyone else is as friendly as they had always been. Meanwhile, as Sofarende falls to the constant bombing of its enemy Tyssia, Mathilde works on maps to determine where their air force should drop their bombs in Sofarende in order to drive out the Tyssians. While Mathilde tries to deal with some of the moral and ethical issues inherent in her war work and war in general, she must also come to terms with loss on several levels. Surprisingly, she gets help from an unexpected source, and moral support from others. All Mathilde really wants is to be best friends with Megs again, and to return to her beloved home and family. But then the horror of war, and the senseless killing and destruction that comes with it are brought home to Mathilde when she is sent to Sofarende on a secret mission. Will this young girl ever find the love and peace she craves? If you haven’t read Beautiful Blue World, I would recommend doing so, but even if you don’t, you will have no problem reading Threads of Blue. There is enough explanation of the events from the first book embedded in this sequel so you won’t be lost. The story is told from Mathilde's point of view, though experience has taken some of the innocence out of her stream-of-consciousness observations. She astutely describes life as a refugee living in a camp set up for Sofarenders fleeing their country as the war intensifies: the constant hunger, the inability to wash, the feelings of frustration everyone feels, all while mourning the loss of their country and loved ones. And when she returns to her homeland, she is stunned by the extent of ruin that the war had inflicted. In that respect, the images LaFleur word paints are particularly poignant and so, so very anti-war. 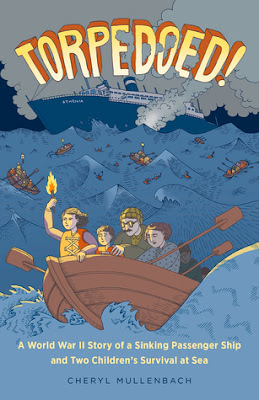 Along that vein, look closely at the cover image of three children, two boys and a girl wearing a knapsack, who is obviously Mathilde, sitting in a row boat. They couldn't look more innocent, until you look more closely and see the faint shadows of bombs falling on them. This image says so much. 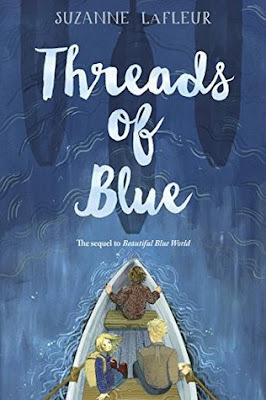 Like Beautiful Blue World, Threads of Blue is a brilliant novel about the ravages of war, but it is also a story about holding on to who you really are even when it causes you trouble, and facing life with bravado, honesty, and hope in a world where none seems to exist. These are two books not to be missed. In December 1943, Dita Adlerova, 14, along with her parents and 5,000 other Jewish prisoners arrived at Auschwitz-Birkenau from the Theresienstadt ghetto (also referred to as Terezín) in Czechoslovakia. Unlike most of the Jews who were transported to Auschwitz-Birkenau, this transport arrived with the notation SB - Sonderbehandlung. 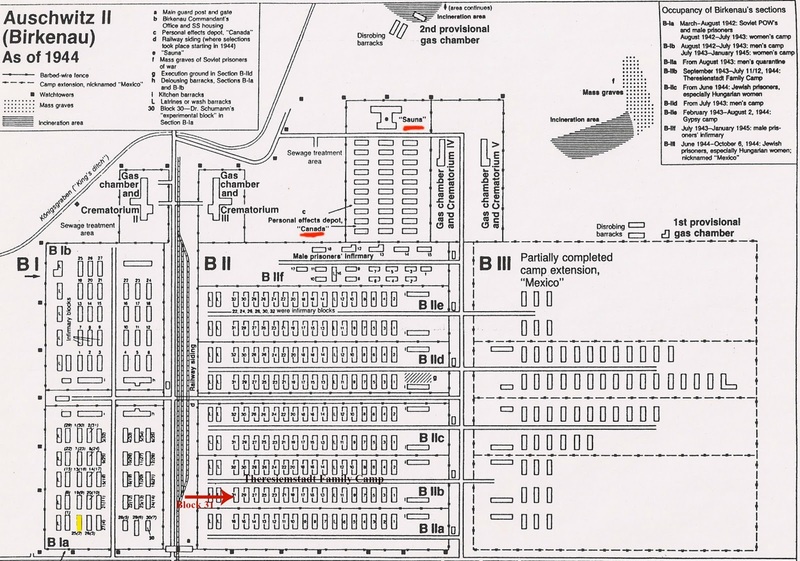 No one really knew what was meant by special treatment, but they were put into one of nine separate camps in Birkenau, called BIIb, and referred to as the Theresienstadt Family Camp. These prisoners were allowed to keep their clothing and their hair wasn’t shaved, although living conditions were just a deplorable as elsewhere in Auschwitz. Thanks for Fredy Hirsch, the prisoner in charge of the children, Dita becomes an assistant in Block 31, a barracks that has been converted into a space for children during the day so that their parents can work. It is also a place that houses a secret school which includes a library of eight books that have been smuggled in by other prisoners and are in various states of disrepair. Dita’s job is to care for the books every day - removing them from their hiding place, delivering them to the teachers, and carefully putting them back into their hiding place. Dita takes her job so seriously, that when a surprise inspection that includes Dr. Josef Mengele happens, she risks everything to hide the books under her smock. But later that day, Dita runs into Mengele again,and she believes that he seems to know that she was hiding something that morning. He tells her he will be watching her from now on. His threat informs Dita’s life in Auschwitz with additional fear from then on, yet it doesn’t stop her from continuing her job as the librarian. The Librarian of Auschwitz is a powerful novel with a brilliant blending of fact and fiction. It is told mostly in the present tense, and I think the writing style may remind you of The Book Thief, especially the voice of the omniscient narrator who knows what has happened as well as what will happen. And I have to be honest and say it is a difficult book to read at times, but then, so are all books about the Holocaust. Several of the characters are based on real people. Most of the Nazis in charge of Auschwitz, like Josef Mengele, the Doctor of Death, and Rudolf Höss, the camp commandant. 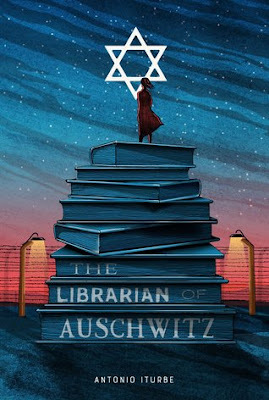 The main character, Dita Adlerova, reflects the experiences of the real librarian of Auschwitz, Dita Polach Kraus, whom Iturbe interviewed in Israel when he was researching this novel. Iturbe also includes the stories of Fredy Hirsch, Rudi Rosenberg, and SS First Officer Viktor Pestek. Hirsch and Rosenberg were prisoners in Auschwitz, while Pestek was a guard who fell in love with a young Jewish girl. 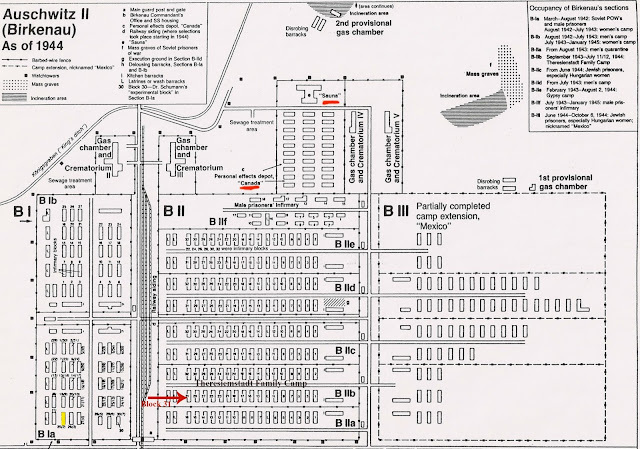 Other characters in the novel are strictly fictional, but whether real or fictional, each one contributes to the overall picture that Iturbe draws of this section of Auschwitz, an anomaly in what was a place where most people were sent to be killed upon arrival. And Dita's story is certainly an exemplary one. In the midst of so much heartbreak and horror, Dita derives a real sense of strength and purpose as the librarian, coming up with ways to improve the delivery of the fragile books to teachers, and carefully repairing them each day when they are returned. And, with the help of Fredy Hirsch, her sense of purpose develops into a way that Dita is able to cope with her own overwhelming fear, learning to accept it as part of who she is, and by recognizing it, she is able to overcome it and go on despite everything. Thus, Iturbe’s draws Dita as a study of courage in the face of fear, and it becomes all the more poignant and admirable as she faces the horrors of Auschwitz, and later Bergen-Belsen. And while the actual atrocities that were endemic in the Nazi’s concentration camps and their treatment of Jews are difficult to fully capture in words alone, readers should know that Iturbe doesn’t hold back, that some of what he writes is quite graphic. Though fear, hunger, cold, death, cruelty, and loss of loved ones are the daily experiences of Dita and the other prisoners in Auschwitz and Bergen-Belsen, ultimately The Librarian of Auschwitz is a life-affirming novel that manages to end on a note of hope for the future. I decided not to go to Comic Con this year, after standing on line to get in for almost 4 hours last year. But I’ve been thinking about comics this weekend anyway. 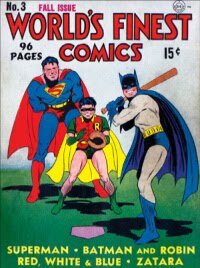 I loved comics growing up and I like to feature some of the comics that were popular during the WWII. Comic are often such a measure of what is happening in the world. And, sometimes, while reading a book for this blog, I come across things about WWII that I didn’t know and that take me by surprise. That’s exactly what happened while I was reading a mystery called The Girl is Murder by Kathryn Miller Haines. On page 36, the protagonist, Iris Anderson, 15, is reading an Archie comic book. Archie in 1942? 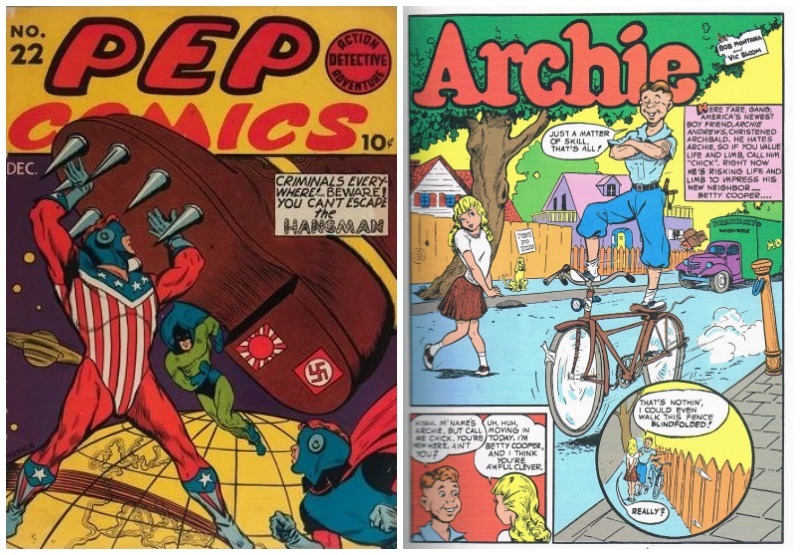 The same Archie Andrews I read all those years later? 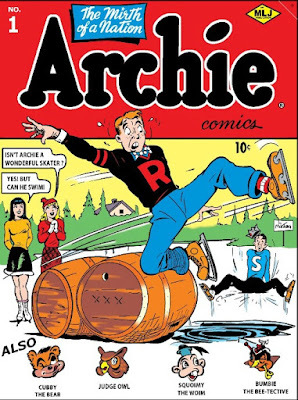 Archie lived in Riverdale, along with his parents Mary and Fred Andrews, and attended Riverdale High School. 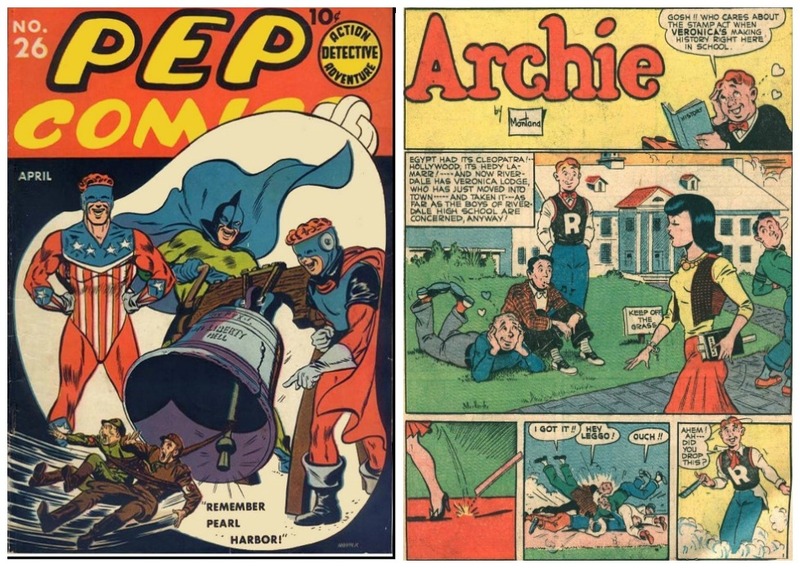 Archie’s infamous jalopy was introduced in Pep Comics #25, dated March 1942 and the very rich Veronica Lodge, middle-class Betty Cooper’s rival for Archie’s affections, was introduced in Pep Comics #26, dated April 1942. More characters were added over the first year, including Mr. Weatherbee, the school principal. 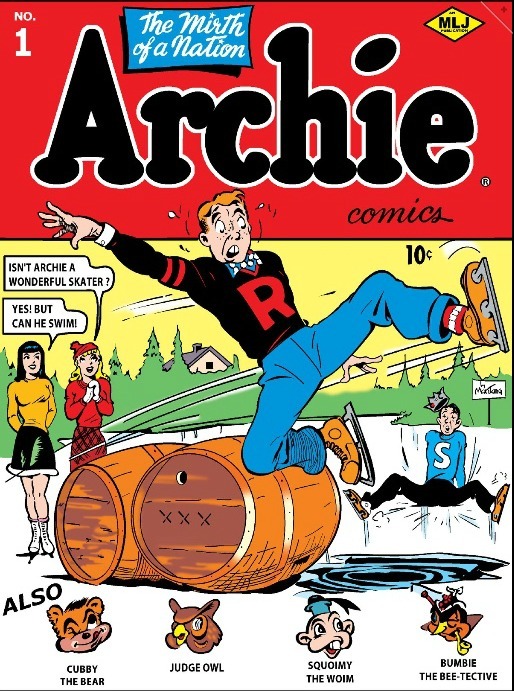 Mr. Lodge, who raison d’être was to keep Archie and Veronica apart, and Archie’s other friend, Reggie Mantle. It is interesting that there is no mention of the Archie story in either of these Pep Comics. 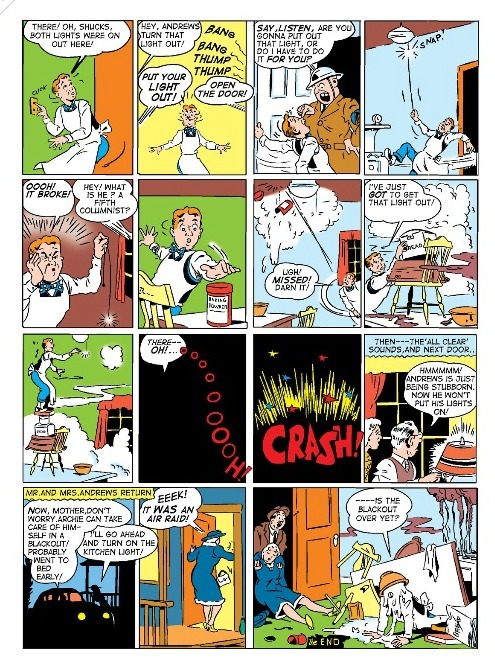 In 1942, with most of the characters in place, Archie got his own comic book, in which he was now billed as “The Mirth of a Nation.” The overall humor in Archie’s adventures is pretty much the same in these early comics and in the ones I read. And although he looked like a total doofus in the early Pep Comics and the first Archie Comics, his popularity continued to grow and his looks mellowed out somewhat. 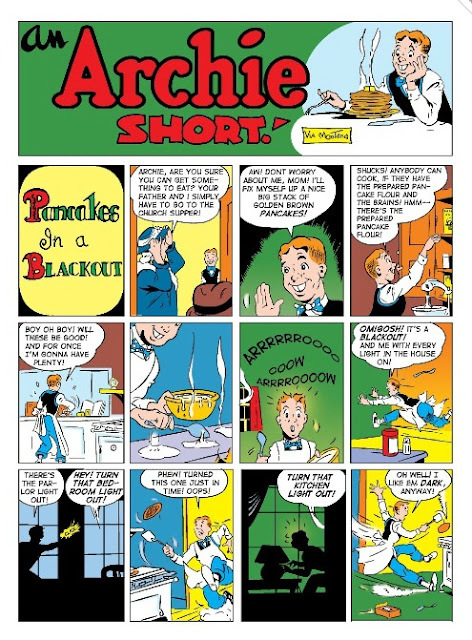 Archie has changed and evolved over time, but it's been fun revisiting those early days of Archie and the gang, and if you are like me, right about now you have "Sugar, Sugar" by The Archies running through your head. 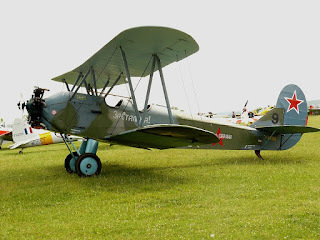 This is the kind of plane the 588th flew in the nightly bombings.